Best Car in the World? Excitement is mounting as Mercedes-Benz prepares to showcase their flagship model, “the best automobile” in the world – the new Mercedes-Benz S-Class – at the Johannesburg International Motor Show from 16 – 27 October. With the three engineering priorities “Intelligent Drive”, “Efficient Technology” and “Essence of Luxury”, the new S-Class extends the boundaries of technology on many levels. The S-Class is not just a technological spearhead for Mercedes-Benz but for automotive development as a whole. As with every generation, the new S-Class will set standards across the board to retain its accolade as “the best automobile in the world”. Perfection down to the last detail results in “The Essence of Luxury”. This pursuit of the best or nothing is particularly noticeable in the interior: whether it is the seats or the air conditioning, the controls or the design, the infotainment or the comfort and safety in the rear – new ideas, their painstaking realisation, and highest perceived quality underpin the high standards that the engineers have set for the new S-Class. The same applies to safety. What started with PRE-SAFE® ten years ago and continued with DISTRONIC PLUS has now resulted in a new dimension of motoring: comfort and safety are merged into one. Mercedes-Benz refers to this as “Intelligent Drive“. A whole host of new systems makes the new S-Class even more comfortable and even safer. The S-Class is ever so efficient: within ten years Mercedes-Benz, by realising “Efficient Technology“, has drastically reduced fuel consumption, while the drag coefficient of cd=0.24, sets a new benchmark. The new S-Class is the world’s first car to dispense entirely with light bulbs in favour of LEDs, once again pointing the way ahead. The classic Mercedes face runs like a golden thread through the brand’s history. The sophisticated design of the S-Class has always been an expression of luxury and automotive grandeur of its era. The new S-Class continues this tradition, with its classic architecture and flowing silhouette. The design draws a line from the sophisticated, progressive design idiom to the classic elegance of our 1930s cars – intelligence that speaks to the emotions. Stylish sportiness and sensual forms and effortless superiority make the S-Class a true design icon. To underline the effortless superiority of the new S-Class, and its ambition to lead, the radiator grille is now larger, upright and distinctly three-dimensional in design. With its long bonnet, the flowing, domed roof line and the gently slanting rear end, the new S-Class has classic saloon proportions. 100 years or so after the introduction of electric lighting in motor vehicles, Mercedes-Benz is now making a complete switch to LED technology – the new S-Class is the first vehicle in the world whose interior and exterior do without a single light bulb and sees Mercedes-Benz building on its pioneering role in the lighting sector. The lighting’s multi-level functionality is another world first: out of consideration for any road users behind, the intensity of the brake lights is reduced at night or while waiting at traffic lights, for example. Almost 500 LEDs illuminate the road, the vehicle, the interior and the boot. 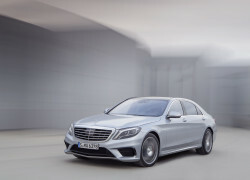 In its first year the new S-Class line-up features: one petrol hybrid version, the S 400 HYBRID; one petrol model, the S 500; and a diesel variant: S 350 BlueTEC. All models boast class-leading efficiency and up to 20 percent lower fuel consumption than the outgoing model series. In addition Mercedes-AMG is also unleashing the new S 63 AMG. This most powerful high-performance saloon in the luxury segment, sets new standards in terms of driving dynamics, lightweight construction and efficiency. The AMG 5.5-litre V8 biturbo engine is the most powerful member of the BlueDIRECT engine family, with an output of 430 kW and torque of 900 Nm – delivering effortlessly superior “driving performance”. 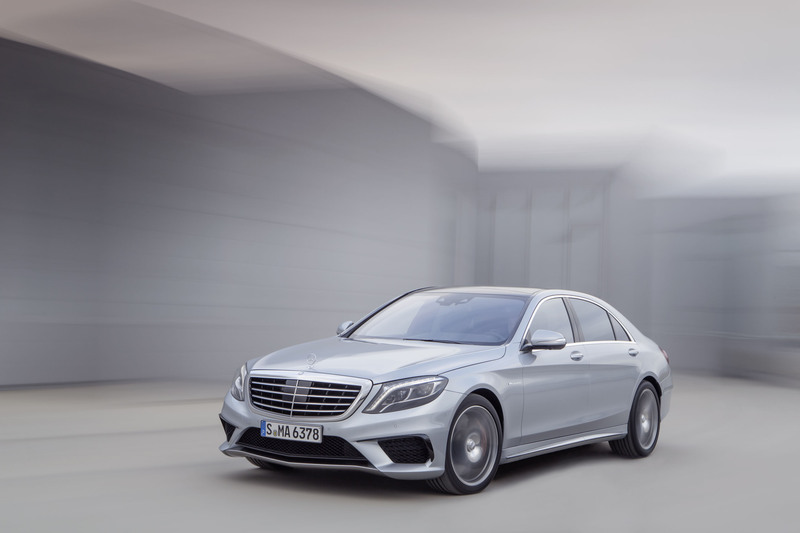 The new S-Class is the true embodiment of a modern luxury sedan: it is an exclusive first-class experience and offers an exquisite feeling of well-being at the same time. Show-goers will be able to experience first-hand the ultimate in luxury motoring at Mercedes-Benz stand in Hall 6 at the Johannesburg International Motor Show. DD - who has written 102 posts on Top Motoring. © 2019 Top Motoring. Powered by WordPress.